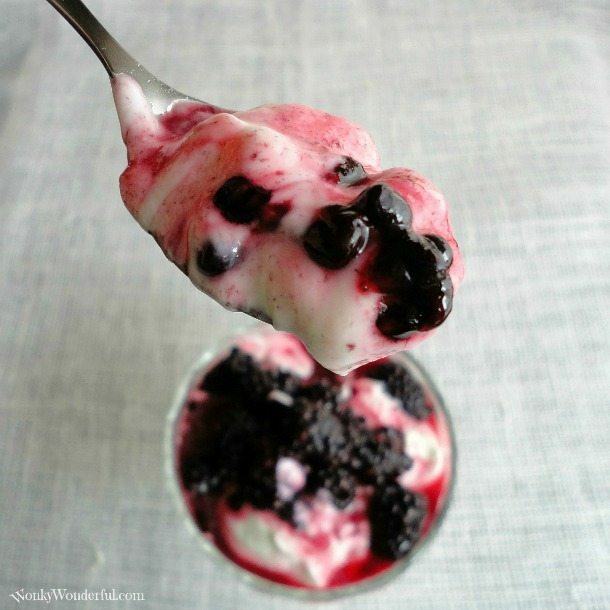 Blackberries and honey are a match made in heaven. The bright burst of berry and sweet honey blend to make the perfect syrupy drizzle. This Blackberry Honey Syrup is so simple to make, there is no cooking involved. Blackberries are one of my favorite berries. The season peaks during summer here when it is about one hundred and ten degrees outside. Picking through thorny, spider infested bushes in one hundred degrees is not my idea of a good time. The pay-off is definitely worth the hassle. The amazingly sweet and juicy, perfectly ripe berries taste like the color purple. Okay, if I’m being totally honest . . . I rarely go blackberry picking. Luckily they are so abundant in my area that during the berry season I can buy a flat on every other street corner. Thanks goodness for my local farmers that save me from scratches, sunburns and bug bites! 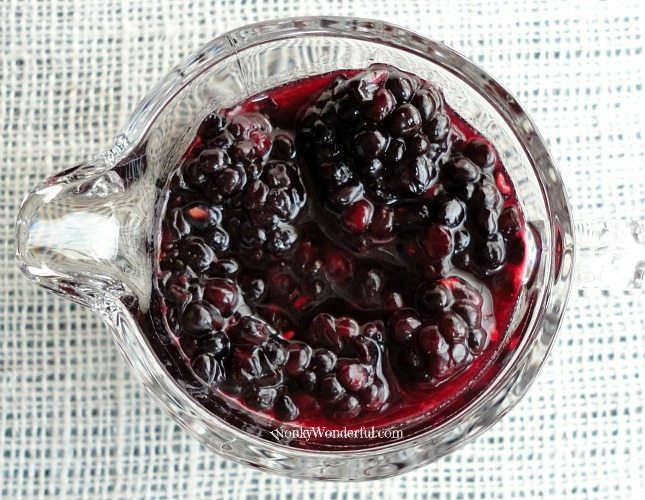 I love to eat them plain, in cobblers, make my Blackberry Frozen Yogurt or mix the berries with some divine local honey to make this Blackberry Honey Syrup. 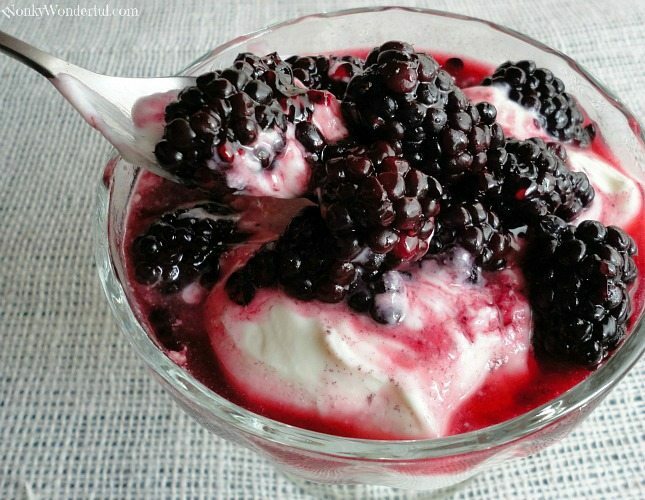 Just mix the blackberries and honey together in a container, cover and refrigerate overnight. I like to leave my blackberries whole, but you can mash them with a fork if you prefer. Stir the mixture a few times. The blackberry juices and the honey combine to make a beautiful syrupy texture. Eat over yogurt, ice cream, pancakes, cheesecake or straight out of the bowl if you so desire. 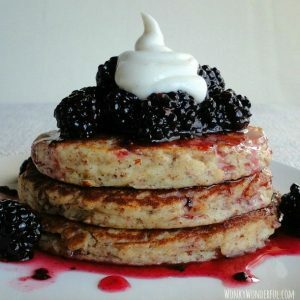 Check out my Almond Pancakes with Blackberry Honey Syrup & Sweet Yogurt Cream! Hi! I love the idea of your whole berry/non strained syrup recipe. 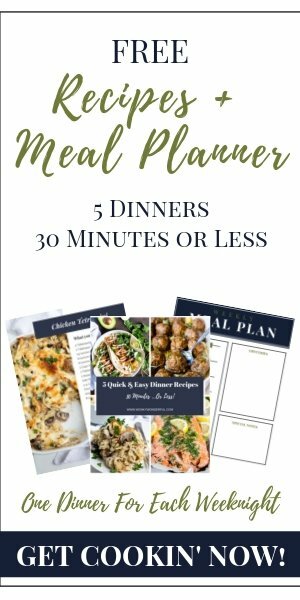 Have you or anyone you know tried canning this recipe? I’ve never tried canning but would like a stockpile of this syrup and am wondering if there is anything I should know before I try this particular recipe. Thanks! Tanon. Sorry Tanon, I have never canned this recipe. I’m not sure if it would work for canning. How long would this syrup keep in the fridge? I would think this should be good for a week. 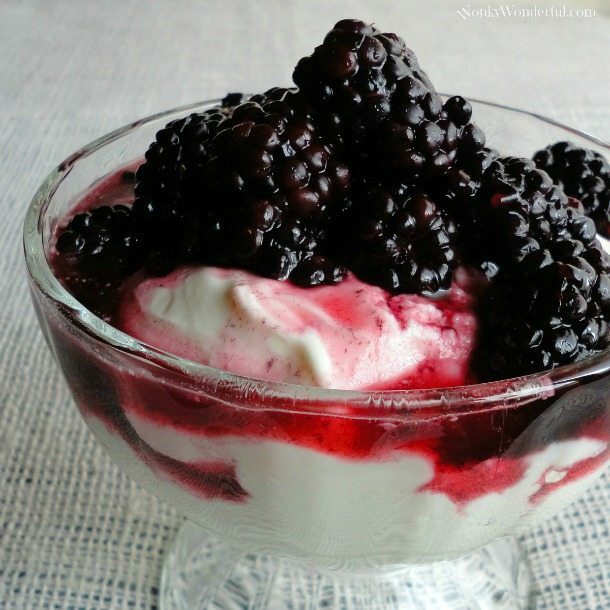 The fresh blackberries need to be eaten within a shorter time period that blackberries that are made into a syrup.